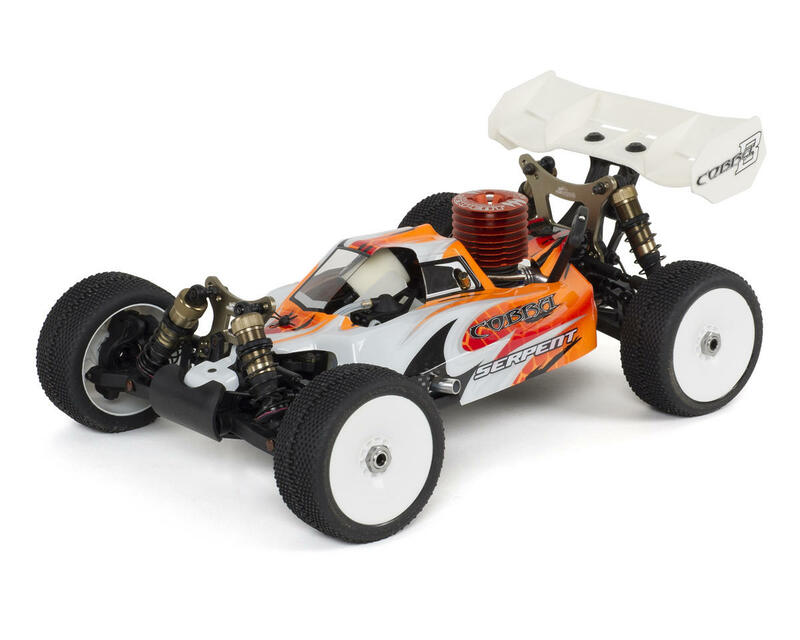 This is the Serpent Cobra 811B Ready-To-Race 1/8 Scale Nitro Buggy, with an included 2.4GHz Radio System and Novarossi .21 Pull-Start Nitro Engine. Designed by World Champion Billy Easton from the USA, the 811B RTR brings all of Easton's knowledge and experience together in this durable, fast and exciting RTR buggy. And to top an already awesome package, Serpent joined forces with Novarossi from Italy, to include the powerful Novarossi 3-port off-road pull-start engine inside the Cobra. 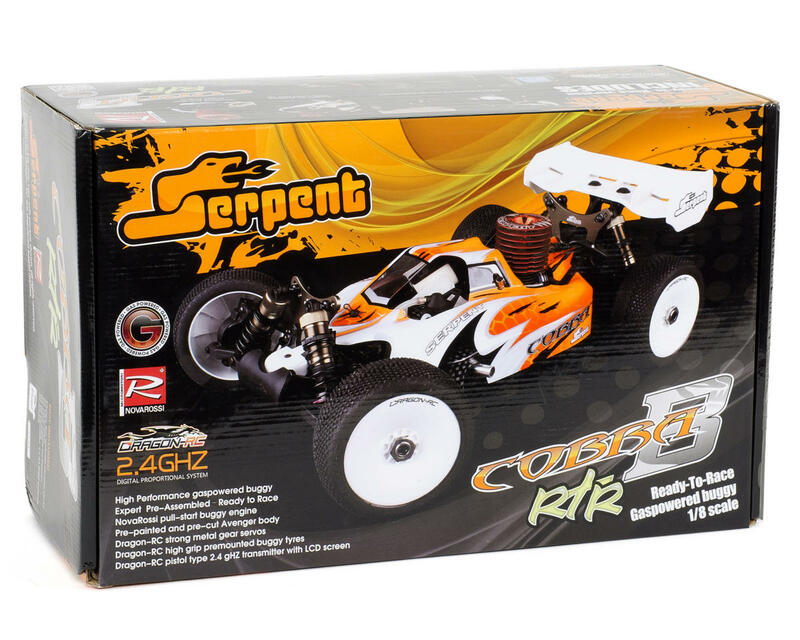 Serpent is one of the leading R/C car brands in the racing world and now brings the quality and excitement of racing into the hobby and ready-to-race market. 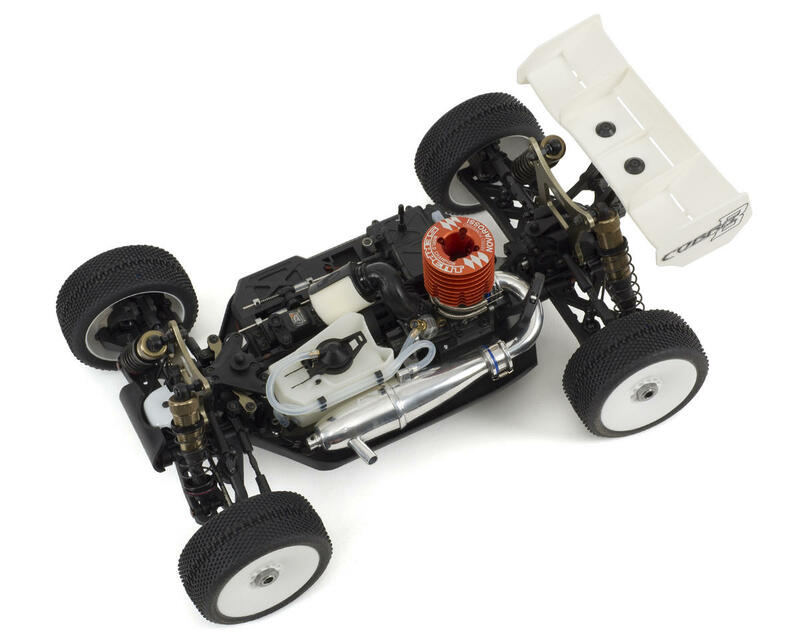 Serpent started back in 1980 and brings all its experience and knowledge together in their wide selection of over 20 different R/C cars. Serpent selected the Italian made Novarossi pull-start engine for the Cobra buggy. 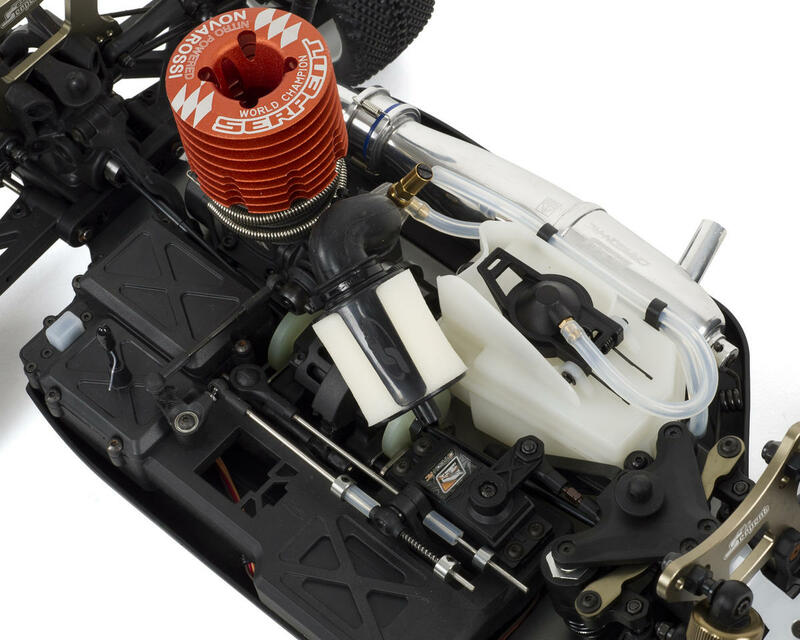 The outstanding quality level, high performance, combined with easy starting and long lasting run time, makes this engine the ideal partner to start racing. Novarossi also offers a special back plate in case you change to a bump start system later on allowing you to continue with the same engine even longer! The engine is mounted securely on machined aluminum engine mounts. The Dragon-RC polished inline tuned pipe system works really well with the Novarossi engine and produces a sharp and powerful tune. Servos: Dragon-RC servo’s are included, which are made by Savox for Dragon RC. The strong 10.5 kg units are durable with metal gears. Chassis: The chassis plate in 3mm 7075-T6 aluminum. The front kick-up angle is for stable landings. There are slots to mount the front and rear suspension mounts precisely. Angled sides increase stiffness. Side Guards: Strong composite side guards keep most of the dirt out and offer good protection for the valuable gear inside. The side guards also double as side stiffeners and influence the flex of the chassis overall. Bumper: Aligned with chassis kick-up for precise landings and to protect the front suspension holder and anti-roll bar. Chassis Stiffeners: Composite stiffeners front and rear; provide extra stiffness, but still allow some flex as needed for extra traction. Central Radio/Servo Mount: Composite compact composite radio box offers good space for the steering and throttle,-brake servo, the receiver and the receiver battery. The whole assembly including linkages can be taken off easily and fast in one go, when cleaning the car, or doing maintenance. Central Low Brake System: The Cobra features a low positioned dual brake system with lightweight glass-fiber disks with spring loaded race-brake pads; very effective stopping power. Clutch: The famous Serpent off-road clutch in 3 shoe version has the right setting for smooth performance, but when you hit the throttle hard it will accelerate the Cobra like crazy. Air Filter: The foam dual action air filter sits very low in the car, and snug fits tight next to the fuel tank. The large opening in the body for refueling will also allow enough air getting to the filter. Steering Block Assembly: Composite steering blocks combined with 10 degree C-hubs for precise steering. Black hard steel wheel-axles with large size bearings, precision threaded aluminum wheel-hubs with offset and aluminum wheel nuts. Front Suspension: Durable oversized lower suspension arms in strong composite nylon. On the lower side the special shaped down stops screws are mounted. The lower shock-mounting pins are secured with a small grub screw from the bottom, so they won’t drop out. Front Anti-Roll Bar: The ball raced front anti-roll bar system, consist of a spring steel bend wire, which is guided through the diff-cases and runs in ball raced steel adapters. The wire is linked to the lower suspension arm, with a captured adjustable threaded pivot ball, for very precise and low friction operation and easy tuning. Front Shock Tower & Body Mounts: 4.0mm thick aluminum anodized shock tower with 3 upper positioning holes for the shocks and 3 holes for roll-center positions. 1 centrally located adjustable body mount, and 2 forward mounted adjustable body mounts. Angled Steering System/Servo Saver: The bell cranks are angled to reduce the angle of difference between the total caster and steering plane. Therefore you will have less bump steer and a truer steering Ackerman through the entire range of suspension. Aluminum Ackerman Plate: With the design of the steering bell cranks when changing the Ackerman you will not need to adjust your steering tie rods. You simply will only need to adjust your end points on your radio. 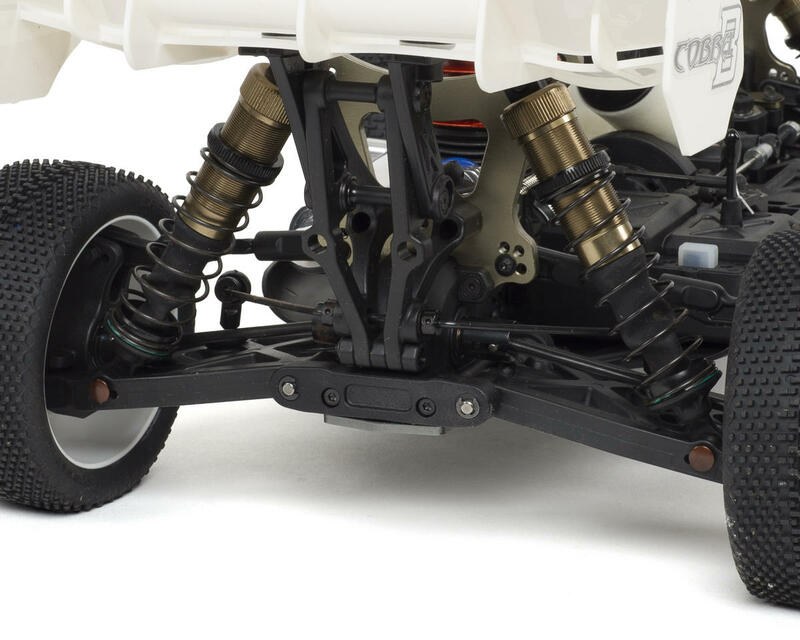 Rear Suspension Arms: Durable longer oversized lower suspension arms in strong composite nylon. On the lower side the special down stops screws are mounted. The lower shock-mounting pins are secured with a small grub screw from the bottom. Rear Uprights Assembly: Composite uprights with 3 upper roll-center positions. Strong steel track-rods with L/R threading and strong ball joints allow camber adjustments. Hard steel wheel-axles with large size bearings and larger inner ones with precision threaded aluminum wheel-hubs with offset, and aluminum wheel nuts. Rear Anti-Roll Bar: The ball raced front anti-roll bar system, consist of a spring steel bend wire, which is guided through the rear wing mount and runs in ball raced steel adapters. The wire is linked to the lower suspension arm, with a captured adjustable threaded pivot ball, for very precise and low friction operation. Rear Shock Tower: 4.0mm thick aluminum tower, integrated into the rear section for extra stiffness, with 3 upper positioning holes for the shocks and 3 holes for roll-center positions. Rear Wing Mount & Body Mounts: Composite rear wing, with strong nylon adjustable rear body mounts on wide body-support bridge located far enough to the rear, to support the bodies in best way. 16mm Big Bore Shocks: Anodized threaded aluminum shock bodies with durable 4mm shock-rods. Pre-load adjusters with o-rings inside for ride height setting. Shocks use large diameter membranes and large diameter o-rings and bushings to create a super smooth and leak-proof package. Large diameter pistons are held in place by a nut on the polished shock-rods tops. Open type spring retainer to let dirt out easy. RCM Shock Springs: Color coded progressive shock springs are supplied for the 1st standard set-up and all springs are ground flat top and bottom, and checked individually for tension and length and matched. Captured Pivot Pins, Balls & Bolted Hinge Pins: All hard steel hinge pins are either captured or bolted in place. This relieves stress on the hinge pin when adjusting the kick up, or anti squat. Your pin is free to rotate to any angle without binding. Rear Wing: Low and strong rear white aero wing is included for great down force and straight line stability. Compact Differentials: Very compact gear differentials with very smooth metal sintered gears, and steel shaft; perfect sealing case with special gasket and o-rings. Very light and durable outdrive cups in spring-steel. Hardened spring-steel 13T diff-coupler with connector running in 2 oversized bearings. The Cobra uses a 13T / 44T combo gearing. 48T central diff gear, combined with 13T clutch bell. 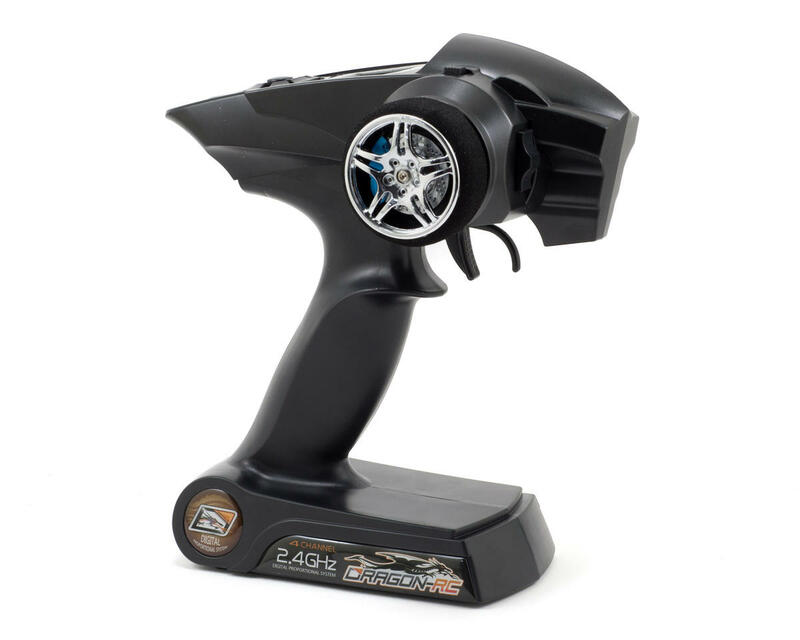 This drive ratio will provide amazing acceleration combined with the low vehicle weight. Hard Black Transmission Parts: The front and rear strong hard black steel cardan shafts connect the differentials. Front & Rear Drive: The front has captured driveshafts using a CVD system. The rear has durable black steel driveshafts with hard steel pins. Avenger Body: Serpent cab forward Avenger Cobra buggy body, fully pre-painted in a very attractive design and pre-cut too. The very sleek body has excellent handling, also super in jumps. 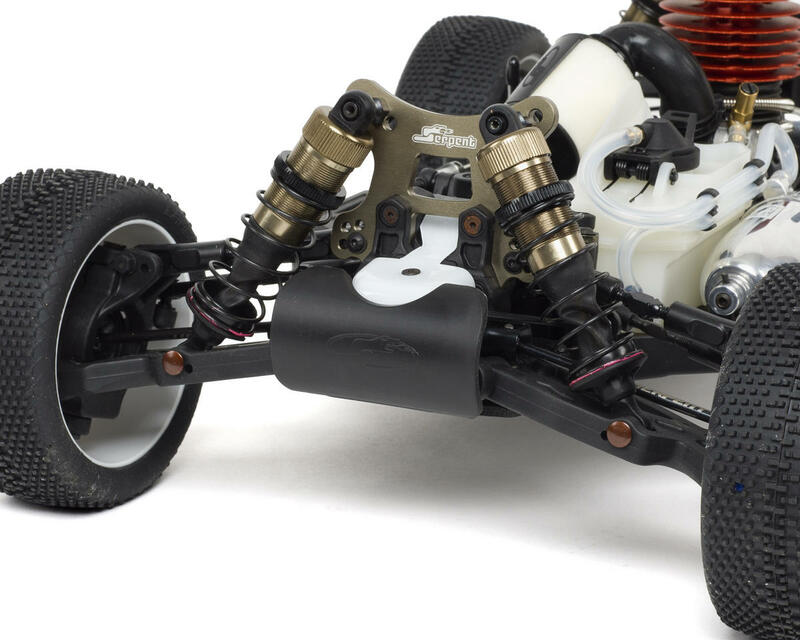 Tires/Wheels: The Cobra is fitted with pre-mounted Dragon-RC buggy racing tires. The tires are glued on durable but flexible Dragon-RC race-wheels with molded inserts; a super-package for excellent grip on the most common surfaces. Oils & Grease: Top-quality silicone shock-oil, silicone diff oil and some grease is used to meet the standard set-up. Manual & Setup: Full color user manual with easy to follow steps, exploded views for easy spares ordering. A separate manual for the transmitter and the speed controller is included. Packing: The RTR kit is packed in a large strong packing box with protection for car and transmitter. Note: The pictured transmitter may not represent the transmitter included with this vehicle. Serpent selects transmitters based on availability at the time of packaging.